From Alex Morgan to Cristiano Ronaldo, Coca-Cola has a long history of using soccer sponsors. Now, for the first time, the beverage behemoth is using a virtual one. In EA’s upcoming “FIFA 18” game for Playstation 4, Coca-Cola will be promoted through the fictional player, Alex Hunter. Gamers can play as Hunter, who, after rising to fame as a member of the LA Galaxy team, signs a deal with Coca-Cola and shoots a commercial in one of the scenes of the game. The initiative is the latest part of Coca-Cola’s 20-year partnership with EA. In June, EA even created a Twitter account for the character (@MrAlexHunter), which already has 49,900 followers. On Monday, Cola-Cola had the character account tease a still from the game. The e-sports industry has grown drastically in the past few years as brands now look to enter the space in new ways. To put in perspective how big eSports is becoming, a Google search for "lol" does not produce "laughing out loud" as the top result. Instead, it points to League of Legends, one of the most popular competitive games in existence. The game has spawned a worldwide community called the League of Legends Championship Series, more commonly known as LCS or LOL eSports. 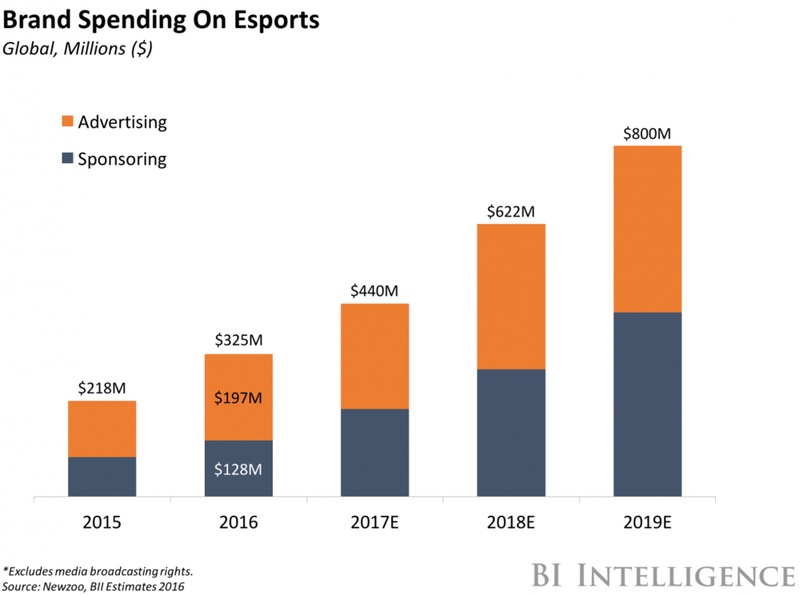 Robert Elder, research analyst for BI Intelligence, Business Insider's premium research service, has compiled an unparalleled report on the eSports ecosystem that dissects the growing market for competitive gaming. This comprehensive, industry-defining report contains more than 30 charts and figures that forecast audience growth, average revenue per user, and revenue growth.